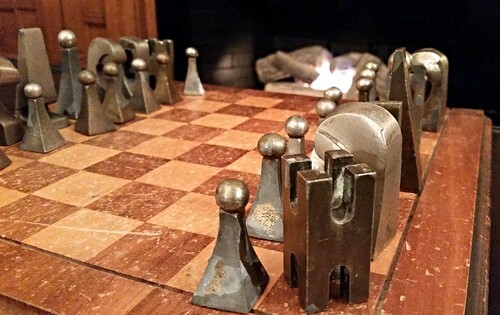 A chess set next to a fireplace. After the craziness of the holidays and of course, the end of the semester, my wife and I went away to Portsmouth for a few days, just to relax and get away. We stayed at the Hotel Portsmouth, which was one of those boutique hotels. They had a good deal and the place was quite nice. In their common areas, they have a fire place and a chess set. Growing up, I used to play chess with my father a lot--often several times a week while we watched Cheers or Jeopardy or whatever else was on. So playing the game brings back those memories (mostly of me getting my but whooped, until on occasion, I would beat him). However, Chris has never really played and only vaguely remembers being taught at some point, so I decided to teach her and now, we have a new game that we can play added to our games list. We didn't actually play with this set--there happen to be 2 sets in the room. This set was too confusing to distinguish the two sides of the board. However, this board, with its notches and marks and worn pieces make for an excellent photo with the fireplace in the background. This submission is part of the 365 Challenge. For 2015's submissions, check out this link to all the posts. For access to all photos, which are open for reuse under a Creative Commons License, check out the full album on Flickr.